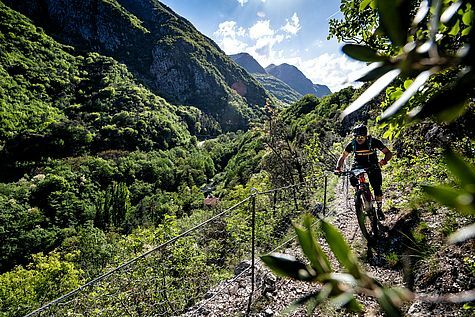 After it's inspiring debut last year, the Bosch eMTB Challenge supported by Trek was also part of the sport programme of the 25th FSA BIKE Festival Garda Trentino again tempting more than 160 participants keen to tackling a challenging adventure. The big field included some famous names from different MTB disciplines like former pro Jose Hermida (ESP), Jerome Clementz (FRA), Fabian Scholz (GER) and Jasper Jauch (GER) as well as festival inventor Uli Stanciu and several representatives of the exhibitors of the outdoor fair in Riva del Garda. In addition, defending champions Lisa Breckner (GER) and Gustav Wildhaber (SUI) were also lining up at La Rocca hoping to keep on hold to their 2017 title. But they weren't the only ones going all in at the eMTB Challenge which combined parts of orientation and enduro races to a pure riding experience which provided three uphill, two downhill and one fun trail challenge. Greta Weithaler (ITA; 7:15 min) of Team Bosch eBike and Jiri Fikejz of Rock Machinem - Cyklomax Team (5:29 min) did perform best. Full results can be checked here.